When you put a hole in the boat, is it on purpose? Yes, I Want Comments ON! Comments. Yes, actually, I want them on! When I was a kid, I was scared of the monster under the bed jumping up to grab me in the middle of the night. Now, I’m kept awake by worries about family. Fear shifts. Don’t let it hold you back. Time flexes and bends according to a lot of different things. I love that aspect of time - especially when cruising. I’m looking forward to it! I set myself a challenge in the middle of last month, to not go grocery shopping again except for beer for my mom. How did I do? Is it hard to make friends while you’re cruising? It can be - and it all depends on you. Here are 3 tips to help you out! A friend sent me a message on Facebook this past weekend, a picture of her and her husband holding a copy of the Caribbean Compass with a press release about the podcast, my picture prominently above the fold. They were on their boat, in Trinidad. We’ve known them since the early 1990s, when we each lived on our respective boats at Portofino Harbour in Kemah, Texas. We shared numerous dinners, hosted potlucks in the marina clubhouse together, and shed tears when we headed off on our first cruise, leaving them behind. They came to our rescue when our beagle broke into the fridge the day after I’d gone grocery shopping and consumed (no joke) 2 pounds of cheese, a pound of chicken breasts, a pound of butter, a quart of milk, and a pint of half-and-half. He needed a few walks during the day the next day, as you might imagine, and we worked more than 75 miles away. Our friendship started in real life (actually, it started before the internet was even a thing) and has continued with the help of social media; we’re looking forward to sharing an anchorage when we get out there again. Toby would eat ANYTHING. This is bok choy, after a market run in Trinidad. This picture, after making me grin and shout and share it with Jeremy, made me think about cruising, and boating friendships. Is it that boating makes friendships easier, or more lasting? Is it somehow the mentality that allows someone to want to live with all the challenges and joys of life on a small boat (they’re all small. All of them) means they’ll be better friends? Or is it that we’ve just been plain lucky? I sit here and think of the many cruising friends we’ve got. There are Lee and Sharon, who passed us our very first morning out on the Gulf ICW in 1993, helped us beach our dinghy in the Exumas with the words, “do you remember us?”, shared a memorable carnival in Trinidad in 1995, and gave me a hug last October at the Annapolis Boat Show when they came by the booth I was helping staff. I had not seen them in more than 20 years. They knew me instantly, and we chatted as if we just saw each other the day before. 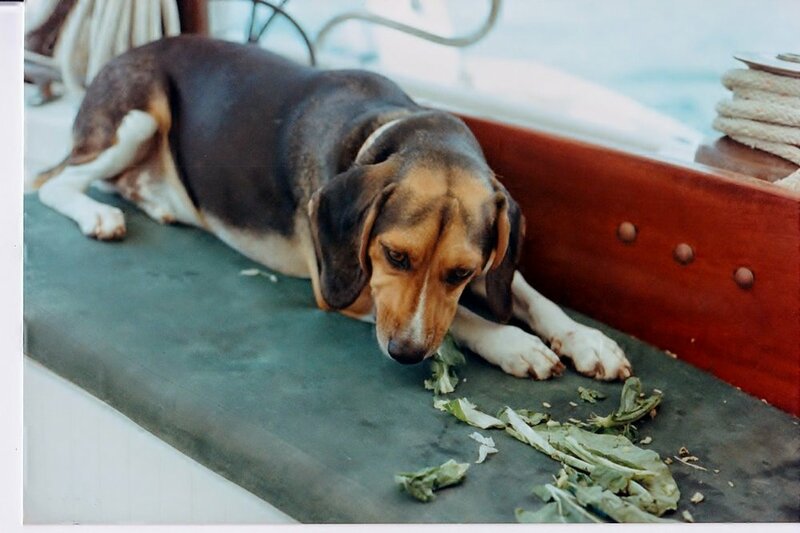 There are memories tied in with the kids too, with people who we shared anchorages with when our only other crew was that same eat-anything beagle named Toby, and then again 10 years later when we had 2 kids in tow. Eileen and David, and Jane and Dudley, appeared totally unexpectedly in Solomon’s in 2002, when we were headed north for a Lyle Hess reunion. We’d last seen them in Venezuela in the mid-90s. Eileen and David are Canadian; Jane and Dudley live in Maryland. Knock knock, Merhaba Merhaba Calypso. Dudley poked his head out and his whole face lit up. And Little Gidding’s Eileen, when we knocked on that hull, promptly invited us inside, enthralling 3-year-old Julian by singing Anchoring Dance in their mola-decorated main cabin with him chiming in. He’s 18 now, and still remembers that moment. There are Rod and Lenora, friends we met in Houston as they were working on their Flicka, detailing fiberglass work to perfection with dental tools; the friendship has continued through their owning of a sister ship to Calypso and a move to Baltimore, and now as they prepare to retire, boatless, to North Carolina to be near grandchildren. Facebook messages and email allow us to keep in touch with them in ways we’d never have done before, though the memories are kept alive as photos resurface. The internet has made friendships both more possible as well as easier to cement. There’s Wendy and Johnny, with their kids Kaeo and Bird, who passed us on the ICW in Florida in 2009, their kids and ours hanging in the rigging as they realized “There are kids on that boat!” A chance encounter that would have faded into memory if not for the power of email and the internet, with a little luck thrown in to boot – instead, we’re fast friends to this day, talking at least once a week and planning weekends together. We got to cruise in Panama for a week because of Facebook, and the friendship we struck up with Behan and Jamie on Totem. Meeting face-to-face happened because we already “knew” each other; the bond we’d forged over many morning messages has been made far more solid because we can trade hugs when we see each other for real. I podcast because of Carolyn Shearlock, a woman I knew from myth and legend and Women Who Sail; we met in person just about 6 months ago, and neither one of us could really fathom that it was the first time we’d actually laid eyes on each other. Sometimes I think cruising forges fast friendships in part because of how fleeting the time together can be. When you are aware, always, that one or both of you will be moving on, the superficial dances around who you really are as people become less important. Time’s a wastin’ – gotta get to know you now, fast. Maybe we’ll fall in love. Maybe we won’t. But we don’t have all day to try to figure it out. This holds true even if you happen to be in between cruises, or if you’ve swallowed the hook for “good.” I feel like we hone in on the real stuff. How do you treat your friends? How do you treat the environment? Are you a decent human being? How old you are, what size boat you have, what your budget is – those things don’t matter. When I meet you, will we be fast friends? Can’t wait to find out. About a year and a half ago, our friends on S/V Totem (check their website!) came for Thanksgiving. Behan and I had "met" while serving as admins together on the facebook group Women Who Sail, met in real life at the Annapolis Sailboat Show in October of 2016, and when it became clear that they'd still be in the US (and even in the relative geographical area to our landlocked Charlottesville) we invited them for Thanksgiving at our house. Hanging out with cruisers is a joy. The vocabulary, the shared experiences, even the sense of flexibility in space-sharing and cooking together is something that is hard to translate. Behan and I have the kind of friendship that feels effortless in many ways. It's hard to believe we haven't known each other forever. During that visit, we casually talked about their plans to go through the Panama Canal and joked about coming down to help them transit. That joke solidified into something approaching a plan. We've purchased plane tickets, told work (and school) we are taking 10 days off in February to go through the canal with friends, and started assembling the stuff we need. Stuff like masks and snorkels, easy-to-dry towels, and all the goodies they might want us to bring down. There's an old adage that cruisers and schedules don't mesh well. Trying to get somewhere on a schedule can mean making poor decisions, ignoring weather, or pushing past discomfort in ways that might not be safe. As cruisers (only TEMPORARILY land-bound), we get that, of course - it's far easier for us to be flexible than it is for them. This may read as weird, if you're not a cruiser reading this. It's easier for a job-and-school constrained person to be flexible? How? Last I checked my boss was not exactly hot on me saying, "Hey, I'll take vacation next week. Or it might be tomorrow. Or maybe in a couple of weeks. That's cool, right?" Cruisers moving their boats, though, are moving their homes. A move that on paper is "only" 20 miles away might take a week of waiting for the right wind, current, waves. As a land-based traveler, a change might be an inconvenience; for a sailor, a change might be disastrous. Part of the extra challenge with a canal transit for a sailboat is that you're dependent on the canal authorities for everything, from getting measured to getting a transit time and even getting a (required) pilot on board the boat. There is just no way to say, "Hey, let's go through on xxxx date" and have it magically happen. This makes it tough if there is crew flying in, with the need to get airfare at a decent price but not knowing when the transit can happen. The phone call came in on a January Saturday, about 2 weeks before we were supposed to fly down to help go through. The word from Totem was that the lag time between measuring and locking in (to start the transit) was running an average of 15 days, not the 7 days that's a traditional average. The weather was crap, making movement difficult and uncomfortable. If Totem was to move as quickly as they comfortably could, they'd get to the marina in Colon to be measured no sooner than the next Thursday, and with the 15 day lag time that put a transit right at the tail end of our existing flight schedule. So we had a choice. Change flights (which may or may not be possible). Or fly in on our already-booked schedule and figure out getting to the Guna Yala (San Blas islands) where we can play with the Totems on board, in cool islands with amazing culture but miss a transit. Bahamas cool islands. Not the Guna Yala. Both were options. Both required more planning than either of us had anticipated. But this, when it comes down to it, is sort of a cruising reminder. Best laid plans need to be cast in sand on a tidal beach, with flexibility required for all involved. Whichever we decided, the crews of Totem and Calypso were together again soon, this time in Panama. Keep reading! The kids are all taller now. The next picture will be an interesting one! All you need to know about living aboard!